It’s easy to start your own Digital Billboard business with Digital Advertising Media and only requires 3 steps. 1 – $149 program (Do-It-Yourself Hosting): Designed for people that have some computer skills and PCs of their own. Use the Control Website to manage your ads on all your systems via the Internet. Grow your business from here as you get more acquainted with the system by activating each additional Ad Server PC for $50 as a one time setup. 2 – $199 (Stick) program (Hosting): Designed for businesses that just want to use the ad server at their location to advertise their own things, sell ads to customers but not really trying to become a digital billboard business. This is great for churches, stores, barbershops, salons, restaurants and doctors offices for information awareness, PSA, Trivia, Ads and more. Comes with website, 1 Ad Server PC and a web login to control the system via the internet. 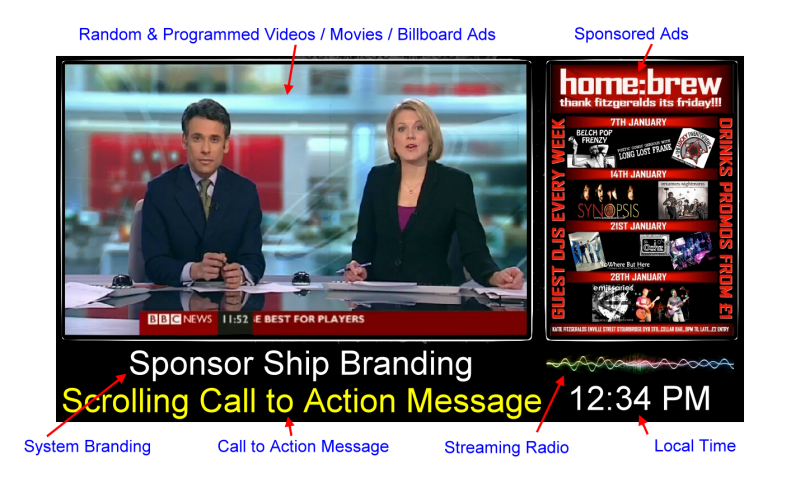 3 – $350 program (Business In A Box): Designed as a starter package to get you into digital billboard advertising business. Come with a professional website, custom branding, domain name and gives you all you need to start selling ads from day 1. This can be placed in locations like plan 2 but now you are actively marketing the fact you sell billboard ads to the public with your own website. Comes with website, 1 Ad Server PC and web login to control the system via the internet. 4 – $696 (Stick) Network Package: Designed for the serious entrepreneur that wants to start a new digital billboard business in their area. Three systems allow you to actively sell ads as a small network of systems, allowing you to give your clients much exposure. This plan also gives you the option to lock down a territory if not already taken so keeping out any competition from A to Z. There is a minimum ad server installation per month to keep an area locked out from other entrepreneurs. New people would have to go through you to get into the business within your lock out zone. Comes with a professional website, 3 Ad Server PCs and web login to control the system via the internet and a lock-out zone or territory that your business would control. Extra Ad Server PCs can be purchased for $199 (Stick) at anytime to expand on your network of digital billboard systems. They come pre-programmed to work in your network of systems, 30 days of hosting pre-paid and ready to install out of the box. All can be control individually via the internet once installed on location and connected to an internet connection. How it all works from start to finish. That’s it, you’re now part of the team.